With many liberals concerned about the prospect of Hillary Clinton walking away with the Democratic nomination there has been increased talk of other potential candidates. Joan Walsh listed several in a recent article at Salon. 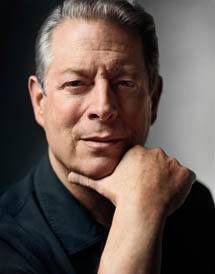 Although I thought it is purely coincidence, I recently noted speculation in light of Al Gore’s planned visit to Iowa this spring. Despite what many political pundits believe, some people do go to Iowa or New Hampshire for reasons other than to launch a presidential campaign. Ezra Klein is now writing that Al Gore should run for president. Single-issue candidacies rarely go far in American politics, but then, Gore need not be a single-issue candidate. Indeed, the rest of his positions are closer in line with Democratic Party activists than, say, Clinton’s. He opposed the Iraq War and endorsed single-payer health care, for instance. His Reinventing Government initiatives, mixed with his Silicon Valley contacts and experience, look pretty good for a post-Healthcare.gov era. And there’s a lot more on Gore’s mind. His most recent book, ambitiously titled The Future, runs through the six forces he believes are changing the world: a globalized network of governments and corporations he calls “Earth, Inc.”; worldwide communication technologies that are leading to the emergence of a “global mind”; massive shifts in power from West to East and from government to corporations; an economic system that too often devastates natural resources; revolutions in genomics, biotechnology, and other life sciences; and, perhaps most optimistically, the beginnings of a revolution in energy and agriculture. The book has been blurbed by everyone from conservative economist Arthur Laffer (“transcends ideology while turning our attention to big issues, big ideas, and big solutions”) to internet hero Tim Berners-Lee (“If you are concerned about the massive changes the world is just heading into, then you should read this book. If you aren’t, then you must read it!”). You can believe Gore a visionary or you can believe him a blowhard, but he’s offering a very different, and much more radical, vision of what politics should be about than even Elizabeth Warren, to say nothing of Hillary Clinton. Gore also has the experience, name recognition, and the resources to launch a campaign, while other candidates would be overshadowed by Hillary Clinton. He has even won the popular vote for president once, and could have won the electoral vote if a full recount was held in Florida, or if not for the butterfly ballots. It sounds like a great idea except for one major problem. I doubt that Gore has any interest in getting back into politics. In follow-up of other recent items, White House Press Secretary Josh Earnest was asked about the story in The New York Post which claims that Valerie Jarrett leaked the information regarding Clinton’s email. He called the report “utter baloney.” Of course those who believe the story will probably not believe his denial. Posted in Al Gore, Environment, Hillary Clinton, Politics, Scandals. Tags: Al Gore, Climate Change, Elizabeth Warren, Hillary Clinton. RSS feed for comments on this post.. TrackBack URL. The issue is not the guilt or innocence of Wilson but the abuses of the process on racial grounds. He never had a trial where all evidence on both sides could be reviewed and cross-examined. The prosecutor abused the system in the way in which he let Wilson off without going to trial. As the article noted, “The transcript of his grand jury testimony read like so much hand-holding by the prosecution.” A Justice Department review is not the way to determine this as the burden of proof for civil rights charges is extremely high and it was never expected they would file charges. They did take the action they could in revealing “abuse and blatant trampling of the constitutional rights,” confirming what I have been saying. “The issue is not the guilt or innocence of Wilson“. Did you manage to write that with a straight face? Now, if only the better elements of both Right and Left could get together to sort out the extortion racket run by the local government machine in Ferguson perhaps something useful could be achieved. But I ain’t holding my breath! Have you even read what I have written on the topic? The issue is the manner in which the normal judicial process was not carried out. The question of his guilt or innocence should be answered with a fair trial in which evidence from both sides is subject to cross examination. You article does go along with what I am saying: “There certainly does seem to be a two-tiered system of justice…” That is the key issue I have been talking about. The Justice Department is working to get rid of the extortion racked–which is directed against blacks, while whites are getting their tickets fixed, if they get them at all.